1) new ad placement scheme! the big blue block-size ad is no more; instead, one has a half-inch blue bar on top (see sample). not intrusive at all. 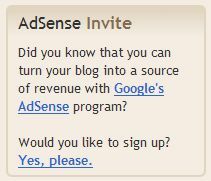 i wonder if AdSense still implements strict guidelines in the application process, though.